The restaurant industry is becoming more and more competitive, as traditional job demand shrinks and an increasing number of people opt to start their own businesses. While you could say that just about every industry is becoming more competitive, the restaurant industry has been one of the hardest-hit industries ever since the recession in 2008. If you are a restaurant owner, you need every advantage you can find to succeed, including a great website. 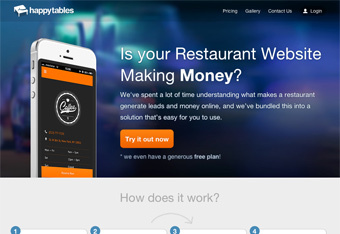 Thankfully, happytables is making it easier for restaurant owners to get the upper hand over their competition – at least on the Internet! Happytables, also known as happy tables, is a WordPress restaurant theme developer that creates beautiful, functional WordPress themes for restaurant owners from all over the world. Unlike most WordPress theme developers, happytables ONLY creates themes for restaurants, making them highly experienced in the industry. Their designers and developers know exactly what works and what doesn’t on restaurant websites, and they have the track record to prove it. Happytables is dedicated to helping restaurant owners increase revenues and succeed in an increasingly competitive market. To make this goal a reality, they have implemented several unique features to their themes. For one, all sites built with happytables themes will be mobile friendly. A large percentage of people that visit restaurant websites do it from mobile devices, so the fact that happytables’ sites will work on all mobile devices is very important. Unlike many WordPress restaurant theme developers, the team at happytables also knows that search engine optimization, or SEO, is vitally important in the restaurant website industry. So, they have taken the necessary steps to ensure that all their clients’ sites will have a fighting chance ranking in Google’s search results. Plus, they monitor traffic using analytics, and follow industry trends to ensure their strategies are up to date at all times.